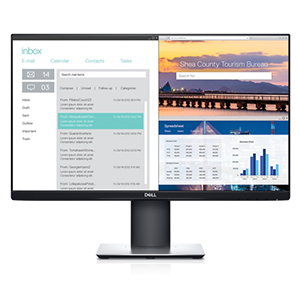 The Dell P2419H Professional 23.8 "display delivers Full HD resolution of 1920 x 1080 pixels with a 16: 9 aspect ratio, 250 cd/m2 brightness, 5 ms response time and a typical 1000: 1 contrast ratio. 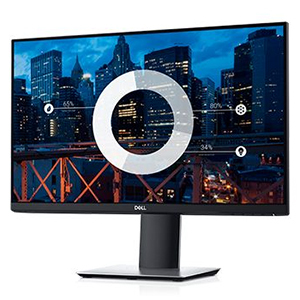 both vertically and horizontally, with VGA, DisplayPort and HDMI connectors, as well as the Pivot function, thanks to which the monitor can rotate 90 degrees. Included is USB 3.0 and DisplayPort cable. More room to work: With a thin profile and the smallest monitor base in its classic, you can free up valuable desk space. Easy on the eyes: This monitor has a flicker-free screen with ComfortView, a feature that reduces harmful blue light emissions. It’s designed to optimize eye comfort even over extended viewing. Adjust to your comfort: Pivot, tilt, swivel and adjust the height of your monitor for a comfortable setup all day long. Get an uninterrupted view of your content across multiple monitors with the three-sided ultrathin bezel design. More desk space: The small base gives you more room to work. 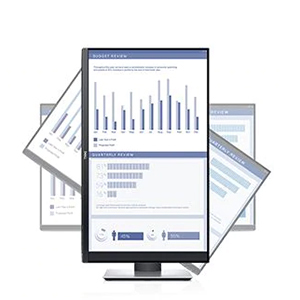 Max multitasking: Quickly organize multiple applications with the Easy Arrange feature on Dell Display Manager software. Clear of distractions: Easily hide away cable clutter with the improved cable management design. Colors at every angle: See consistent and rich colors with In-Plane Switching Technology.